R.A. = 20h 29m 07s Decl. 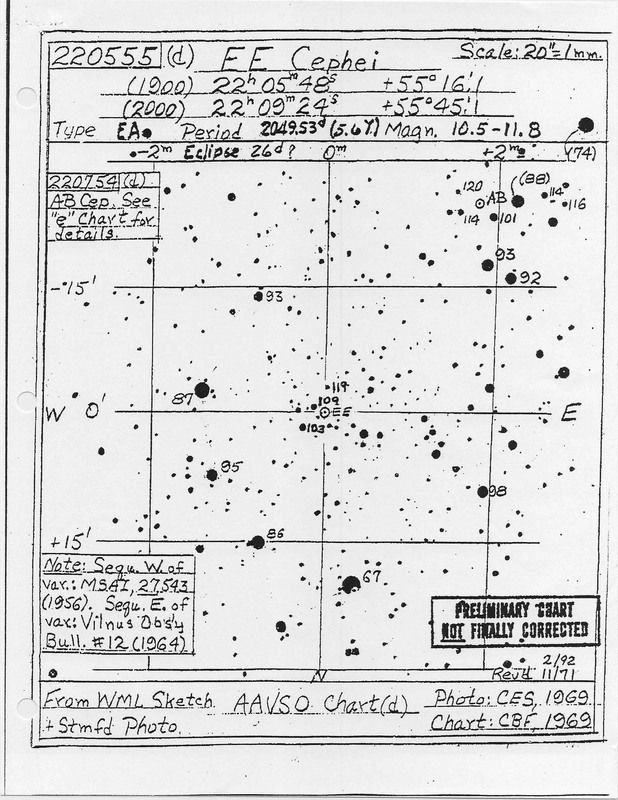 = +52o 27' 45"
The accompanying finder chart from the AAVSO Variable Star Atlas shows the position of the nova. Please use this chart to observe the nova and report your observations to AAVSO Headquarters so we may inform the astronomical community. Congratulations to Peter on his latest discovery! He also reports that the star nearest to this position on the ESO B Survey is of magnitude 18-19, with no obvious color, and located at R.A. = 18h 06m 28.68s Decl. = -25o 52' 32.1" (1950). McNaught further reports a magnitude estimate from P. Camilleri, Cobram, Victoria, Australia, on February 15.724 UT at 9.4. 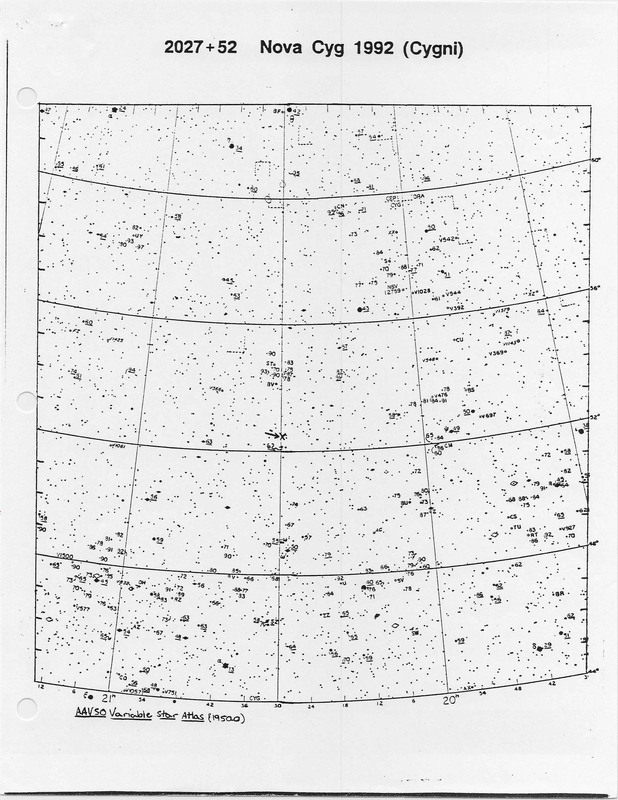 Please use the accompanying finder chart in making estimates of this nova and report your observations to AAVSO Headquarters. The offsets from the galaxy nucleus are 27" east and 10.5" south. Further magnitude estimates are: Feb. 7, <13-13.5 visual, R. Kushida; Feb 13.75, ~14 photovisual, S. Sasaki; Feb 14.54, ~13.5 visual, Y. and R. Kushida. Congratulations to S. Sasaki on his discovery! Edward Halbach, Estes Park, CO, has alerted us to the upcoming eclipse of the interesting eclipsing binary 2205+55 EE Cep. This star, with a period of 2049 days (5.6 years), has been in the AAVSO program and has had limited coverage. Ed has been monitoring EE Cep for several years, and he informs us that the midpoint of the next eclipse is predicted to occur on March 9, 1992. The AAVSO data indicate that the duration of the eclipse in 1986 was about 60 days. 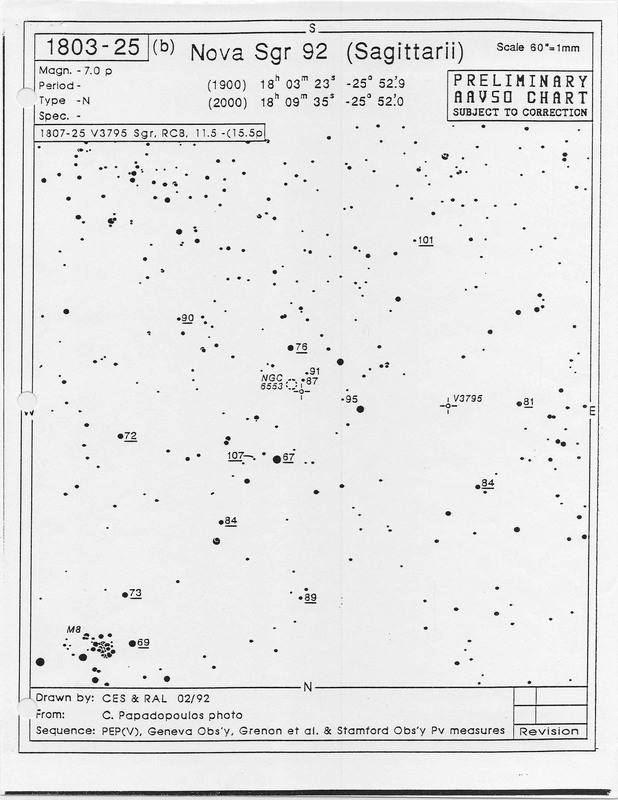 Accompanying is an AAVSO preliminary chart for EE Cep. Marvin Baldwin, Chairman of the AAVSO Eclipsing Binary Committee, recommends that observers use the 10.3, 10.9, and 11.9 comparison stars on this chart in monitoring the eclipse, which is well located for northern observers. Please send your observations to AAVSO Headquarters so they may be added to the AAVSO data files on this very interesting star. The answering machine (617-354-0484) at AAVSO Headquarters is on nights and weekends for your convenience. Thank you very much for your efforts and for your valuable astronomical observations.